Group of twenty (23) carte de visites of various 19th century personalities, some from life others from engraving. The grouping includes: Three (3) cabinet card photographs includes Victor Hugo (novelist who wrote ‘Les Misérables’), Sir Henry Irving (English stage actor) and Roland R. Conklin (an American financier and real estate mogul). 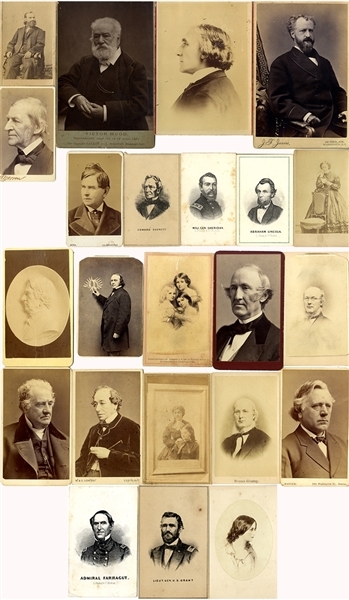 The fifteen (15) CDV’s include; Disraeli (Only British Prime Minister to have been Jewish by birth), Barney Williams (Actor), Ralph Waldo Emerson (poet), Wendell Phillips (abolitionist), Horace Greeley (publisher, abolitionist, presidential candidate), Horace Greeley (clipped coreners), Lonfellow’s Wife, Longfellow’s children, Jean Louis Rodolphe Agassiz, (scientist), William Seward (marble bust), Rev D.D. Braygdon, Robert Collins, CDV of a framed photo, noy ID’d but likely Helen Keller and Anne Sullivan, and two unidentified CDV’s. The (5) five engraved images include; Abraham Lincoln, General Grant, General Sheridan, Admiral Farragut, and Edward Everett.